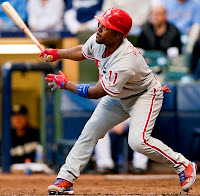 PBR - Jimmy Rollins hit a run-scoring single off Francisco Rodriguez with two outs in the 10th inning and the Phillies rallied in their last at-bat for the fourth straight day, beating the Brewers, 7-6, in Philadelphia to complete their first three-game sweep of the season on Wednesday. The win increased the Phillies' winning streak to four games. They celebrated with their eighth win in 12 games since the All-Star break and moved closer to getting out of last place. The Phillies remained 9 1/2 games behind in the wild-card standings. "What we've done the last couple days is what we're capable of being," said center fielder Shane Victorino, who seems to be mentioned in a different trade rumor every day. "It's been fun." Michael Schwimer (2-1) allowed an unearned run in the 10th, but earned the win. John Mayberry Jr. walked with one out in the 10th against Rodriguez (2-6). Eric Kratz followed with a double. Pinch-hitter Carlos Ruiz hit a sacrifice fly to tie it. Rollins then ripped an RBI single to right-center to end it. "We were playing kind of rough at the end and stayed with it," manager Charlie Manuel said. "We did enough to get by."